A unique and inspiring percussion synth, and the perfect partner to the Mother-32. The lack of MIDI is disappointing though. Unique and powerful sound engine capable of gorgeous, punchy percussion and rich basses. Inspiring to tweak and experiment with. Patchbay opens plenty of new avenues, and is great when hooked up to external gear. Lack of MIDI is a hindrance for studio and live use. First unveiled at last year’s Moogfest, Moog’s DFAM (or Drummer From Another Mother), is a percussion synth successor to 2016’s Mother-32. Like its predecessor, DFAM is a semi-modular hardware instrument, housed in a fairly compact metal chassis, which combines classic analogue synth elements with a built-in sequencer and Eurorack-friendly patchbay. While DFAM undoubtedly has a more rhythmic remit than the Mother-32, it would be a misnomer to describe it as a drum machine. With just a single synth voice, no preset recall and a fairly basic sequencer, DFAM has neither the polyphony nor programming complexity you’d expect from a modern groovebox. More accurately, this is an analogue monosynth designed to specialise in electronic percussion, atonal textures and punchy synth sounds. The subtractive sound engine is based around two oscillators accompanied by a white noise generator. The oscillators each have square and triangle modes, and both have a wide frequency range, spanning a full ten octaves (ie pretty much the entire audible frequency spectrum). There’s a switch to select whether both, neither or just Osc 2 tracks the pitch of the sequencer. We also get a switch to engage hard sync, and a rotary for introducing frequency modulation, whereby Oscillator 1 modulates the pitch of Oscillator 2. A mixer section then lets users set the level of each oscillator, along with the noise source. The DFAM also features an external audio input on its patchbay, which replaces the noise oscillator and shares its mixer level control. Note that, despite being minijack sized, this input is set up to work with Eurorack gear, so lower volume signals - such as that from an iPhone or MP3 player - won’t work without amplification. The signal then hits a dual mode filter, switchable between HPF and LPF settings. The filter itself is a 4-pole (-24db) Ladder design with resonance that can be pushed into self-oscillation. As we’ve come to expect from Moog gear, it sounds great - thick and rounded when rolled into lower frequencies, but also gritty and abrasive with the resonance pushed up. The three envelope generators are probably the most significantly character-shaping elements of DFAM though. These are hard-wired to oscillator pitch, filter cutoff and VCA level, but each also gets its own output in the patchbay. Controls for these envelopes are fairly limited, but well tuned to suit the DFAM’s sound engine. Each of the two oscillators have bi-directional controls for adding envelope controlled pitch sweeps. We then get a single VCO Decay control for adjusting the length of the envelope modulation. Similarly, the VCF envelope has a bi-directional amount rotary, and then a single decay control for adjusting the length. There’s also a Noise/VCF Mod dial for modulating the filter from the Noise Oscillator, which is great for adding a rough, distortion-like tonality to sounds. The amp envelope, meanwhile, has a decay rotary and a switch for flipping between slow and fast attack times. All three envelopes are also affected by the Velocity level coming from the DFAM’s sequencer. Despite the limited amount of tweakable parameters, these envelopes work really nicely with the setup of the DFAM. All three are tight and punchy, so dialling in pitch sweeps and filter modulation can add real attack heft, creating sharp percussive sounds that will cut through a mix cleanly. At the other end, each has a decent decay length too, and fully drawn out, the DFAM becomes a surprisingly adept drone machine too. Sonically, DFAM is pure quality, with a real distinct character. Between the wide oscillator ranges, sync and FM options, noise source and punchy envelopes, it feels really well equipped for crafting synth percussion with plenty of timbral variation. From deep kicks with a sharp attack, to satisfyingly crunchy noise snares, raspy square wave percs through to metallic, bell-like FM tones, there are plenty of strings to its bow - particularly once you bring the patchbay into the equation. Saying that, it definitely lends itself to experimentation more than pre-planned sound design. Moog claim that “absolutely no experience is needed for human beings of any age to quickly begin synthesising new and unique rhythmic compositions.” This is true in the sense that anybody who can find the sequencer Run or Trigger buttons could get some kind of sound out of the DFAM. This statement feels a little misleading though; in reality, DFAM is a fairly esoteric instrument, even if you ignore the modular side of things, and a decent knowledge of synthesis is a must-have if you want to create specific, rather than random sounds. Being semi-modular, DFAM offers a 24-point patchbay letting users re-wire its internal routings and connect it up to external modular gear. The selection of inputs and outputs are what you’d expect for a synth like this, mostly corresponding to the important elements of the front panel. We get inputs for sequencer Tempo, Clock and Run/Stop, along with Trigger and Velocity inputs and outputs, and a sequencer pitch output. Each envelope gets a decay control input and an EG output. There are also direct modulation inputs for the filter, amp, noise level, FM amount and each VCO’s pitch. Both oscillators have their own outputs too. While the patchbay offers plenty of modulation options alone, it’s certainly best paired with an external device, like the Mother-32, which has a slightly more extensive patchbay with an output multiplier and dual LFO outputs – a notable omission here. While still basic, the Mother-32’s keyboard is better equipped for sequencing pitched patterns too, making it a superior tool for creating melodic patterns. Luckily then, DFAM comes with handy official Moog patch leads to get you started. This isn’t necessarily a criticism, more just a comment on the way it’s marketed. In fact, some of the best sounds that we created during our time with DFAM came from blind experimentation rather than calculated synthesis. Happy accidents are very much part of the process too - the wide ranges of some of the front panel parameters means that precise tweaks are often hard to make, and small adjustments can have a major impact on the overall sound. To Moog’s credit, DFAM comes with an excellent manual. We love the physical overlays it ships with too, which act like presets - pop them over the front panel and they show you exactly where to set each control for different sounds and rhythms. The sequencer side of DFAM, meanwhile, is pretty basic. There are eight steps and two lanes controlling pitch and velocity. Data is inputted for each step by a pair of small and, again, slightly imprecise rotaries that can make it a little difficult to tune steps when working with more melodic patches. It’d be easy, and advisable, to add more ‘pro’-feeling rotaries to the sequencer yourself. Control wise, we get a single Run/Stop button, an Advance button - for moving through sequencer steps without triggering them - and a Trigger button for triggering the currently selected step. There’s also a tempo dial, with a full range of 10 to 10,000 BPM, which is impressive, although it does make it difficult to set precise tempo settings. Which brings us to our biggest bugbear: DFAM’s lack of MIDI I/O. The patchbay does allow the sequencer to be sync’d and triggered via CV/gate, which is perfect for connection to the Mother-32 or Eurorack setups, but the omission of MIDI makes standalone studio or live use difficult. Effectively, if you want to hook DFAM up to a DAW or a more straightforward hardware drum machine, you’ll need to use a CV-equipped intermediary (something like the Beatstep Pro). 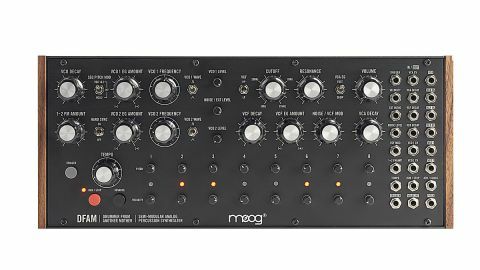 This is obviously a design choice by Moog, making DFAM feel more like an addendum to the Mother-32 ecosystem than a standalone instrument. This is a shame though; one of my favourite things about the Mother-32 is that it acted as a nice bridge between straightforward MIDI-equipped studio gear and the more CV-centric world of Eurorack, which isn’t the case with the DFAM. There are plenty of drum machines and samplers out there which would pair great with DFAM, so it’s a shame direct MIDI sync isn’t possible. Also, since DFAM is capable of some gorgeous, pitched tom-like percussion and rich bass, we’d love to be able to hook up a MIDI keyboard. DFAM is nevertheless a top quality creative percussion synth, but it’s worth considering how you plan on using it. If you already own a Mother-32, this should definitely be on your wish list. We spent some time using the two side-by-side for this review, and they really do pair together brilliantly - the synth engines compliment each other well, and the Mother-32’s patchbay opens up a significant number of new sound design and synthesis options. Similarly, if you’re looking for an interesting new drum voice for a Eurorack system, this is highly recommended. For broader studio use though, we’d advise you to have a think about how DFAM would fit into your workflow before purchasing.